CPM’s Redi-Rock hostile vehicle mitigation system is an ingenious security barrier system that protects from vehicle impact. The modular walling system is a fast, effective, re-useable solution to hostile perimeter vehicle attack that is ideal for protecting critical infrastructure and buildings of National importance. 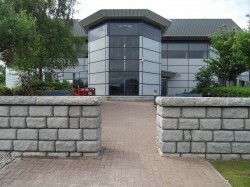 Redi-Rock has been successfully used throughout the UK by high profile clients to guard buildings of great significance. 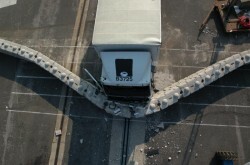 Redi-Rock is fast to install and is proven to stop a 7.5 tonne vehicle at 48 kmph (30mph). The Redi-Rock hostile vehicle mitigation system has been tested by the Transport Research Laboratory (TRL) using the BSi specification PAS 68:2007, and achieved a classification of V/7500 (N2)/48/90:1.6/0.0. The necklace effect means the concrete walling blocks slide to absorb impact, resulting in just a 1.6m penetration of the load carrying space with an integral cable dissipating kinetic energy. Redi-Rock uses its own weight so has no ground anchor which enables it to be relocated or removed as your development grows and requires minimal maintenance so your hostile vehicle mitigation system will look as good for years to come. The quick to install Lego like system (30m can be laid in circa 1.5 – 2 hours by 2 – 3 men) is available in 3 finishes: Cobblestone, Ledgestone and Limestone that are aesthetically pleasing with a look of natural stone and can be coloured to blend into any local environment ensuring that your property is protected whilst still looking good. The PAS 68 approved blocks are delivered ready to build and are dry laid with no need for cement, formwork or shuttering and only minimal foundations so work can begin as soon as delivery is made and with the number of people required to build the wall reduced, both risk and time on site is decreased. CPM has a solid reputation for delivering quality products and providing a first class service and offers a complete solution which includes a full design, engineering and technical support service that consists of full construction details with project scheduling and management, a full bespoke engineering service for unusual and problem situations, manufacturing and quality control at every stage of work, as well as an installation service should you need it and all work has professional indemnity insurance for your peace of mind. The CPM Group also holds the Quality Management System ISO9001:2008 certificate for the design and manufacture of pre-cast concrete products for the building, civil and railway engineering sectors. 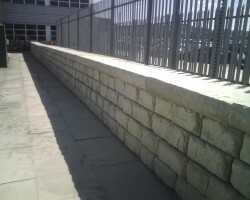 Redi-Rock hostile vehicle mitigation system is part of a series of Redi-Rock modular walling products produced by the CPM Group that include retaining walls and free standing walls that are ideal for housing, rail, highways, landscaping and water applications.